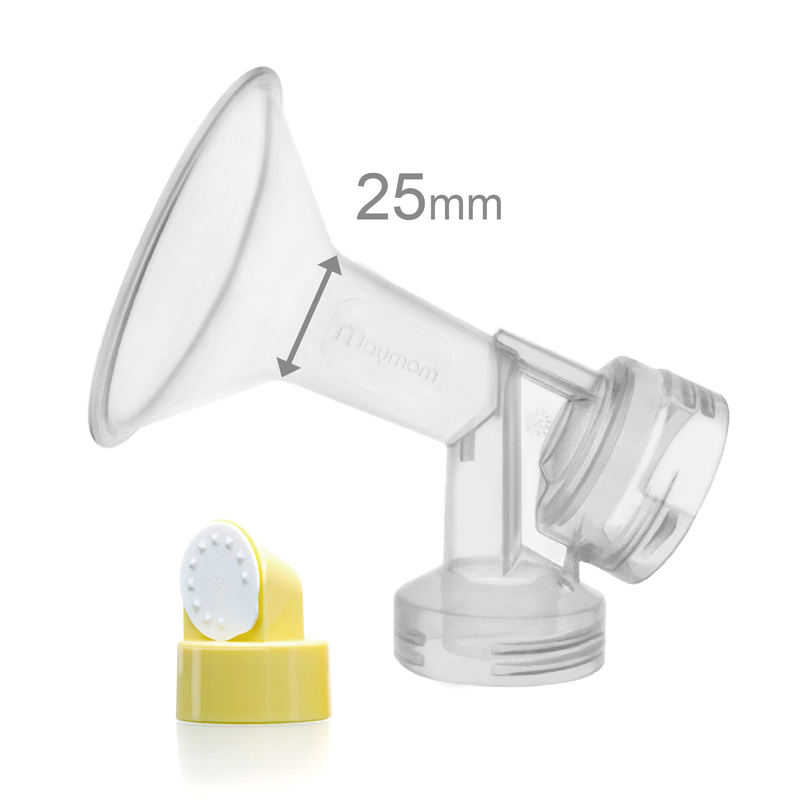 Maymom develops one-piece flanges (breastshields) that are compatible with Medela and speCtra breastpumps. We also have flanges that can fit Ameda pumps. Made from BPA free PP material. Steam safe, autoclaveable. One piece design for easy cleaning. Standard sized 25 mm inner diameter; more comfortable for the majority of breast feeding moms. Other sizes to choose from -15, 17, 19, 21, 24, 26, 27, 29, 30, 34, 36 mm one-piece flanges, and 22 mm insert to use with 25 mm flange and 28 mm insert to use with 30 mm flange. Compatible with all Medela pumps except FreeStyle and Harmony. It is also compatible with older speCtra breastpumps (Dew 350, 360). With an addition of a flange adapter, it can connect to a backflow protector using in Spectra S1/S2/M/9Plus pumps. It is well known that using the correct breastshield size is important for your pumping comfort. After years of research, it is clear that 25 mm sized breastshields fit the majority of the breast feeding moms the best. However, some big name breatpump companies still offer 24 mm as the standard size. Other breastpump vendors, such as Avent, Ameda, already make 25mm ID as the standard sized breastshield for their breast pumps. This product can give Medela users a choice of 25mm breastshield while keeping their favorite Medela breastpumps. To autoclave, place the flange in 121oC, 1 kg/cm2 (or 14.2 psi) for 15 minutes. Test reports done by independent lab show that Maymom flange does not change physically after the autoclave procedure (autoclave report), and it can still pass the FDA 21 CFR, 177.1520 specifications for polypropylene (FDA PP report). Disclaimer: Medela, Freestyle and Harmony are registered trademarks of Medela Holding AG, Switzerland. Maymom is not affiliated with Medela nor does Medela endorse the product.